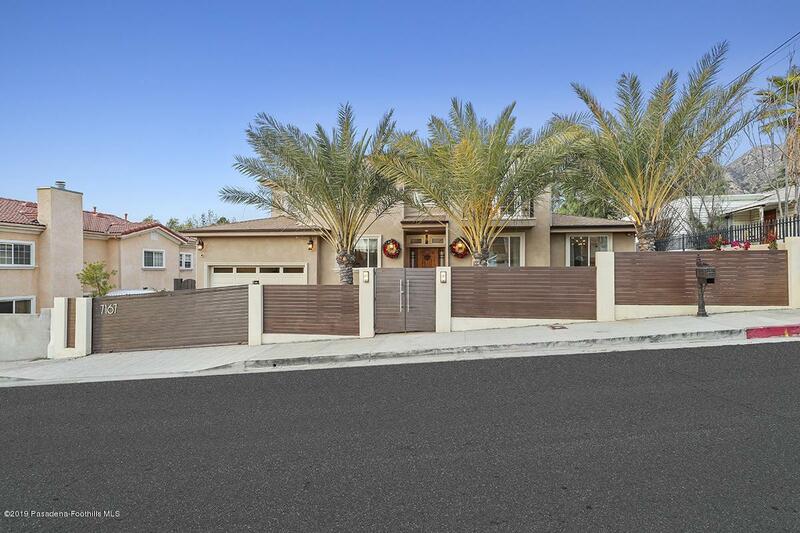 Private and luxurious 2014 construction, with tens of thousands of dollars in owner upgrades, starting with the exquisite steel privacy fence with automatic gate that encloses the landscaped front yard and driveway, and the three mature Date Palms. Inside, you are greeted with 16 ft.-high ceilings, open floor plan, abundant natural light and majestic views to the north. The inviting kitchen with pantry and granite counters features custom-fitted Samsung Chef line refrigerator. Premium Sonance speakers (also added by owner) are built into the ceiling, and the family room with fire place looks out past double French doors upon the landscaped back yard. One bedroom and full bathroom on 1st floor. Upstairs are bedrooms, full bathroom, laundry area, and the palatial master suite with walk-in closet, soaking tub and shower stall, and a balcony overlooking city-lights vistas to the west. The back yard has mature hedges for privacy and lovely open space for playtime, relaxation and entertainment. The attached garage has 20-ft. ceiling and custom-built 2000 lb. capacity storage. Copper plumbing, fire sprinklers, energy-efficient features, security system and more. Inclusions: Samsung premium Chef line Refrigerator.